International Journal of Research in Health Sciences,2014,2,1,190-194. Background: Premature rupture of membranes [PROM] is the spontaneous rupture of membranes prior to the onset of labour and can occur any gestational age even at 42 weeks of gestation. 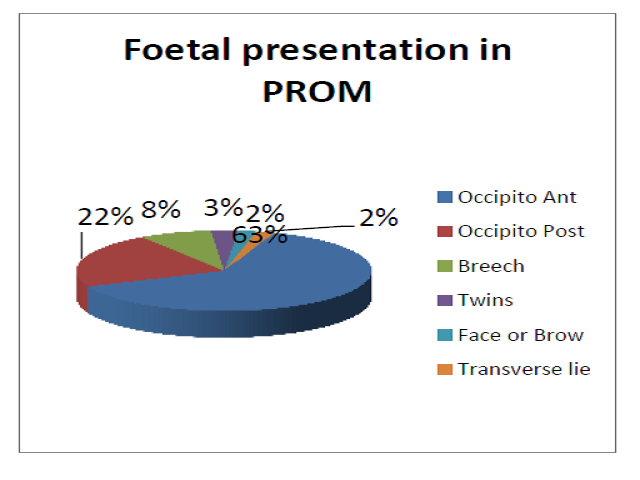 PROM can be term or preterm (< 37 wks). Materials and Methods: The study was conducted in Obstetrics department of Narayana Medical College Hospital from August 2007 to October 2008. Results: Total deliveries during study period were 4010. Of them 246 had a complaint of PROM giving an incidence of 9.8%. Maternal morbidity in the form of puerperal pyrexia and wound infection the incidence in case of PROM was 15%. Indicating the 3 fold increase in maternal morbidity. Swabs from this cases were taken and sent for culture. The culture was positive in 11 Cases and negative in two cases. Conclusion: Most of the fetuses are delivered vaginally. Risk of caesarean section is more in those cases that are managed conservatively. Maternal morbidity increases with increase in duration between rupture of membranes and delivery of the fetus.